Here’s me, on a (yet-again) hot day in Bali’s capital, negotiating a deal on ­­fixtures for my son’s new bathroom when I feel it: the moment when the gritty sandpaper in your belly reminding you you didn’t eat breakfast realizes it’s well past noon and pulls the reptilian alarm in your hypothalamus that shrieks if I don’t get a guacamole-colored rice-flour pancake rolled around some sweetened, grated coconut soon, someone may DIE. Fortunately I have bottled water and a plan. Across the street from Telaga Mas, a cornucopia of tubs, tiles, and everything loo-related, there’s a local supermarket with tiny parking slots built for the tiny cars we all used to drive, and a cake counter just to the left of the main entrance where amid the displays of room-temperature fried risoles that are parceled with hot green chilies, and sweet yeast rolls filled with what-were-they-thinking combos like bananas and processed cheese, and the cubes of sliced crust-less white or bright green bread (remember folks, this place was colonized by Dutch administrators, not French pastry chefs), lie a few greatest hits from the long and venerable tradition of Malay rice-flour pastry. I don’t advocate these as a substitute for a molten chocolate cake, or a pear and marzipan tart, or even an almond croissant. They’re not designed to be the glossy finish to meal. But when you’re up to your neck in faucets, and your blood sugar is plunging down the toilet, look no further. Or should I say look far and wide, because it turns out my death-defying dash across the relentless stream of cars and motorbikes speeding along Teuku Umar Street is in vain. I don’t know what this world is coming to when it’s easier to find a hydrogenated-fat croissant or twenty varieties of factory donuts than a hand-rolled, sweet rice confection in a small Asian city. Starbucks and JCo Donuts may line the street, but the traditional pastries, I’m told by a nonplussed salesgirl, are gone. Of course they are not all gone from Bali. Attend a Balinese wedding, or a tooth-filing, or any of dozens of ceremonies that mark the milestones in the Balinese life cycle, and you’ll likely spot at the welcoming stand, among the fried peanuts, and the brown and yellow layer cake, and the bottled jasmine tea, little green rolls filled with the fruit and sugar of the bountiful, abundant, iconic, affordable, versatile, humble, life-giving, lauric acid-rich—and let’s not forget delicious—coconut. Viva kue dadar and viva Bali. Heat sugar and water in a small saucepan until sugar is melted. To remove any debris, strain the mixture into a heavy-gauge saucepan (about 2-quart/liter) and stir in the grated coconut. Simmer, uncovered, over medium heat, stirring occasionally, until the liquid has evaporated, about 15 minutes. Remove from heat and allow to cool. 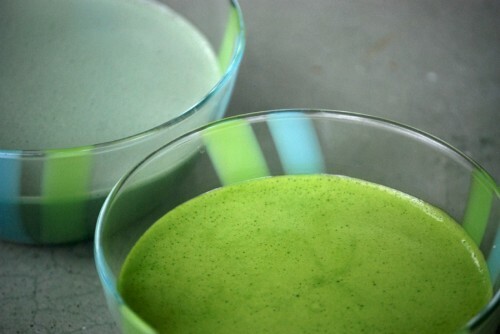 Put the coconut milk and suji leaves in a blender and blend until the liquid is green, about 30 seconds. Strain and set aside. Mix the rice flour, cornstarch, and salt in a medium-sized bowl until evenly blended. Whisk in the egg, then slowly whisk in the green coconut milk until you have a smooth batter. Stir in the oil and set aside. Heat a 20-cm (8-inch) non-stick pan over medium heat. For each pancake, add about 3 tablespoons batter to the pan and swirl around until the pan is evenly coated. Allow the pancake to cook until the top has solidified, about 1 minute. (There is no need to flip the pancake.) Slide the pancake out of the pan, top side up (this will be the inside of your rolled pancake), and repeat with the rest of the batter, stacking the pancakes as they are ready. Gently peel 1 pancake from your stack and place on a clean, flat surface. Lie a generous fingerful of filling partially across the lower one-third of the pancake. 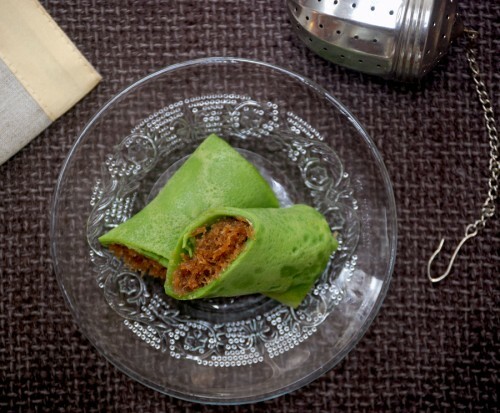 Roll 1 turn, fold the edges toward the center and roll 2 more turns to complete your first Dadar Gulung. (Gulung means roll, by the way.) Repeat until done. *For fresh, thin coconut milk, mix 150 g ( 1 cup packed) finely grated fresh coconut (white flesh only) with 300 ml (1 1/4 cups) water. This will yield the amount you need for this recipe. If you are using canned coconut milk, which is usually quite rich, I suggest you dilute by half with water. If you don’t have suji leaves, reduce the amount of water used to make the coconut milk by 3 tablespoons and replace that liquid with 3 tablespoons liquid chlorophyll. ~ Bobby, March 5, 2011 at 4:40 am. We put them on the menu at Batan Waru. ~ Kitchen in Surgency, March 6, 2011 at 7:47 pm. 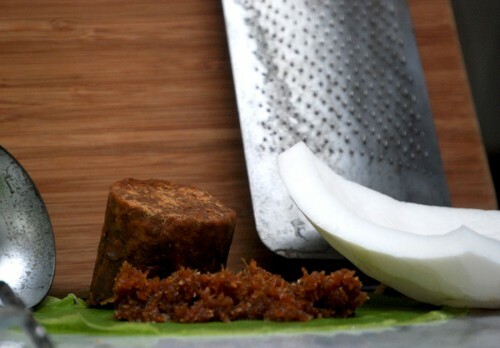 yuuuummmm… no lawar for nyepi? ~ novi buana, March 14, 2011 at 11:30 am.